Andrew Castles and Dan Brown. 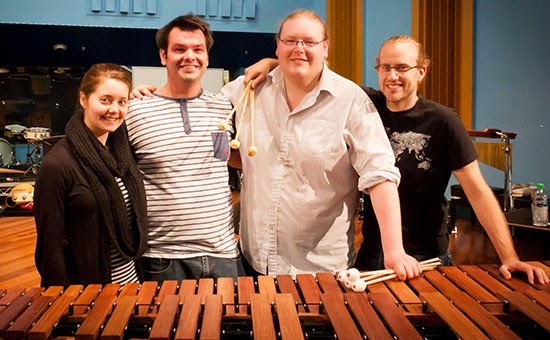 THE Derwent Valley Concert Band has just the thing for anyone looking for something different on Father's Day this Sunday – a performance in the Farrall Centre at the Friends’ School in North Hobart. Dubbed "the Derwent Valley Concert Band with Loose Canon and Friends" the concert starts at 2.30pm and will see the band join forces with one of Hobart’s leading vocal ensembles under the direction of TSO chorus master, June Tyzack. Together they will present a program of music both theatrical and dramatic from some of the great American composers, past and present. Entry will be by donation. George Gershwin's Cuban Overture - a late work not often performed these days but one that is exciting, full of life and latin rhythms. With this piece, Gershwin introduced concert audiences to the latin rhythm section instruments: claves, maraccas, the guiro and bongos, giving them solo status by placing them at the front of the orchestra at the premiere performance. 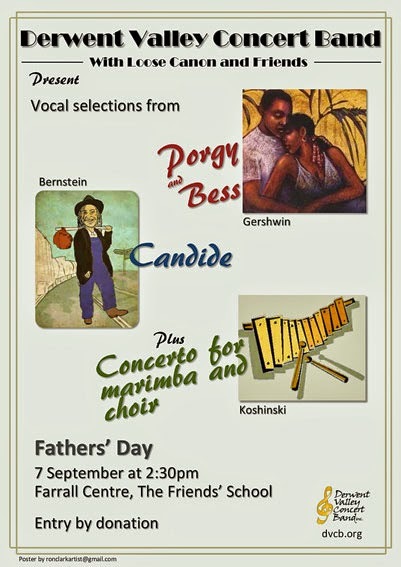 Highlights from the opera Porgy and Bess will include well-known and much-loved songs such as I Got Plenty o’ Nuttin, Summertime, It Ain’t Necessarily So, and Bess, You is My Woman Now. Leonard Bernstein's operetta Candide, an adaptation of Voltaire’s satirical novella about a young man’s journey through all the lessons of life, opens with a sparkling, witty, ebullient Overture, heard here in a superb transcription for band by Clare Grundman. After many "lessons" – facing the Spanish inquisition, surviving shipwreck, a forced marriage and being sold to slavery - to name but a few, the cast unite on a simple farm, and the work closes with the moving Make Our Garden Grow, a metaphor for the flourishing of humanity. Stephen Melillo is a music educator and prolific composer of music in all genres. He has a particular love for, and has written a great deal of, music for film. The Gift of Love is a tender and passionate tribute to the great Hollywood composer Erich Korngold and After the Storm for chorus and band, while not film music as such, certainly has all the excitement and drama of a blockbuster movie. Gene Koshinski's Concerto for Marimba, Choir and Percussion will be a highlight of the program. Koshinski is a music educator, percussionist and composer. Marimba concertos are not particularly numerous but this one is more unusual than most, if for no other reason than for the use of the choir instead of an orchestra. The piece is highly virtuosic and will be great fun just to watch but it is also very musical with a sensitive and most lyrical slow movement flanked by what have been described as “exuberant and primal” outer movements. The soloist in this Australian premiere will be Andrew Castles.